Relocating to New Brunswick from Cornwall, Ontario, Mr. Lefebvre has had a distinguished career since graduating from the St. Lawrence College of Applied Arts & Technology with a Bachelor’s degree in Administration (Finance) in 1982, having since been the Vice President, Research & Standards for the Certified General Accountants of Canada (CGA Canada) and the Chief Executive Officer of Addiction Services of Eastern Ontario. His most recent postings have been as Chief Executive Officer of the Community Futures Development Corporation and as Chief Regulatory Officer of the Human Resources Management Association. 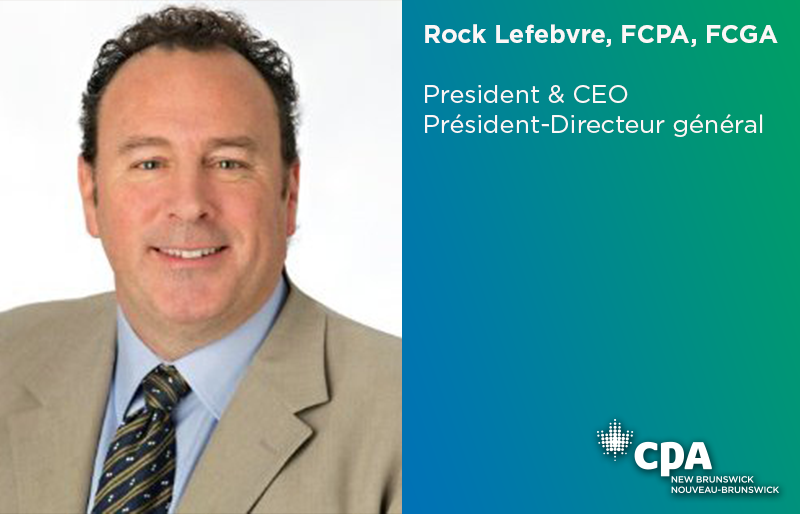 Mr. Lefebvre achieved his legacy CGA designation in 1989 (honoured with a FCGA Fellowship in 2007) and was awarded his FCPA Fellowship in 2014.